There are certain rules that need to be followed to make an entertaining film: an interesting premise, a strong cast, a story that makes you wonder how they are going to end this and a decent twist during the finale. Now You See Me follows these rules and so we have a movie that I came out of completely satisfied. Four magicians, the cocky J. Daniel Atlas, mind reader and hypnotist Merritt McKinney, former assistant to J. Daniel, now a fully fledged spectacle magician Henley Reeves and con artist Jack Wilder, are brought together by a mysterious benefactor to perform in Las Vegas, where they pull off an incredible feat: robbing a bank in Paris while still on stage thousands of miles away. FBI agent Dylan Rhodes is forced to work with Interpol agent Alma Dray in discovering how they did it, not realising that this is just the tip of the iceberg and that the gang have a lot more up their sleeves. First things first. When I left the cinema after seeing this, I left with a big smile on my face, like I had eaten a delicious and satisfying meal. I drove home and all the way home, I thought: Yes, I was thoroughly entertained. Something that doesn’t happen too often when going to the cinema. So if it set out to do that, it succeeded. 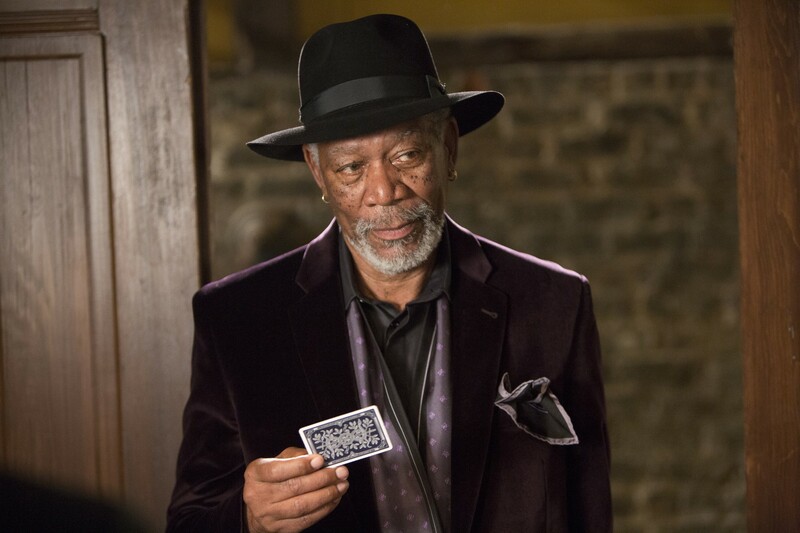 Now You See Me has a real old-fashioned feel to it while being totally modern. The heist capers of the 60s sprang to mind except here, the whole film deals in mis-direction, the tool of a good magician. You really have to concentrate if you want to get every detail. This can be very hard, for director Louis Leterrier keeps things moving at a breath-taking pace. There doesn’t seem to be much flab; every inch of the running time is used. The script, while in places is a little contrived and occasionally silly, has plenty good going for it than bad and the relationship between the magicians are nicely drawn out. It’s the relationship between Rhodes and Dray that the script really wins, helped by casting two fine actors in the roles, making the chemistry between them work. The cast is a dream. Jesse Eisenberg, who a few years ago I callously called a Michael Cena clone, is slowly becoming far more than that. He is establishing himself to be more than a one-note geek character, and as the big-headed J.Daniel, he manages the feat of being both loveable and detestable at the same time. Woody Harrelson once again proves he is always good value and you cannot ignore a film that has Michael Caine (playing Michael Caine but who cares) and Morgan Freeman sharing the screen. The real winners here are the always excellent Mark Ruffalo as Rhodes and Melanie Laurent as Dray. Their relationship is incredibly believable and the real heart of the film. If I was to make a criticism about this terrific slice of entertainment, it has to be the camera work. Leterrier refuses to keep it still, so we get shot after shot where the camera spins around the protagonist or is shaking here and there and it is totally unnecessary. In fact, after a while it was making me feel a little woozy. I’m not sure if this was meant to help with the mis-direction of the plot but it just became an annoyance, as the story and the acting didn’t need such distractions. Having said that, it was a great big fun thrill with plenty to amaze (the magic scenes were well executed) and plenty of big laughs too (and I mean, BIG laughs). It also delivered right to the end with a nice, if somewhat predictable, twist but who cared? By the end you are full and wanting more. In a year when many films are failing to hit the mark, it’s nice to see something original almost scraping the bullseye.